Get customized HR Email List, HR Mailing List, and HR Telemarketing list to reach Human Resource Executives, HR Managers, HR Directors and VP of Human Resources in the USA, Canada, UK, Australia, Middle East, South Africa and Asia. Blue Mail Media’s HR Email List can help marketers in a significant way by enabling them with comprehensive marketing information on the target market. The role of Human Resource executives is no more limited to recruitment, training & development, performance appraisal, compensation and so on. Their role in an organization has today extended as a strategic partner and a strong agent of change. They hold considerable decision making power and are proactively involved in top of the line strategy making in an organization. Due to their evolving role, marketers are aggressively looking out to connect with them and promote their products, solutions and services that are related to workforce management as well as other business functions. Our HR Professionals Mailing List covers all extensive information to connect with target prospects via telephone, mail or email. It has been meticulously designed to support your multi-channel marketing campaigns and help you achieve better response rate as well as conversions. Since inception, Blue Mail Media has helped many organizations with its accurate, authentic and reliable database that never fails to deliver the best results. Also, considering that each business has different challenges and priorities, we offer to our clients pre-packaged as well as customized List of HR Directors, HR Managers and HR Executives based on their special preferences. Blue Mail Media has a strong network spread across USA, UK, Canada, Europe, Asia, North America, Australia and other countries around the globe. This enables us to serve you in a global yet local way. 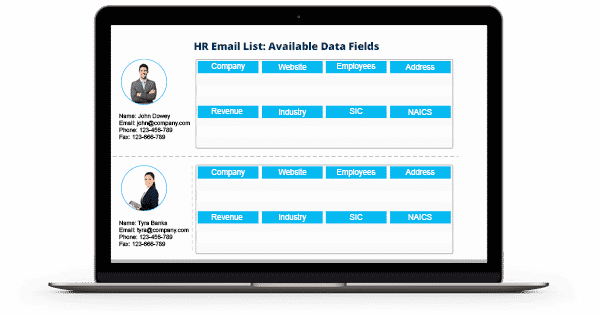 Moreover, our strong team of data scientists, analysts, and experts put a lot of hardship in keeping our HR Executives Email Database up-to-date, so that you derive maximum benefits from your marketing campaigns. 1. How accurate and reliable is your HR Executives Email List? - Our HR Executives List is 85-90% of precise and gives you more than 90% deliverability. Our team of specialists verifies and updates the data in our email list every 60 days to maintain its accurateness. 2. Do you offer any customization option for HR Executives Email List? - Yes. We provide our HR List in both prepackaged and customized format to meet your industry needs. You can easily customize the data in our email list based on your preference such as geographical location, SIC code, NAICS code, job title, company’s revenue and other. 3. Can I use the HR Executives Mailing List to target the businesses worldwide? - Yes. You can use our HR Executives Mailing List to reach all HR Directors, HR Managers, and HR Executives across the globe. The regions we cover are - the US, the UK, North America, Canada, Europe, Australia, Middle East, South Africa, Asia, and many more. 4. Do you rely on any trustworthy sources for HR Executives Email List? - Yes. We have a team of analysts who collect the data from highly credible sources to provide you with 100% authentic data. The sources include government records, phone surveys, job portals, newsletters, yellow pages, business directories, trade shows, conferences, events, corporate websites, meetings, public records, business trade magazine subscriptions, and many more. 5. Do I get all the required information of prospects from your HR Executives Email Database? - Yes. We provide you with all the essential marketing information in our HR Executives Email Database. The data includes- first name, last name, company name, job title, revenue, annual sales, company size, phone number, fax, geographical location, web address, SIC code, NAICS code, and many more. 6. Does your HR Executives List follow all the guidelines of GDPR and Anti-Spam law? - Yes. Our HR Mailing List complies with GDPR and Anti-Spam law. So, you don't have to bother about its legitimacy. 7. In which format do I get my HR Executives Mailing List? - After you complete the payment procedure for our HR Executives Email List, we will email you the list in Microsoft Excel format.